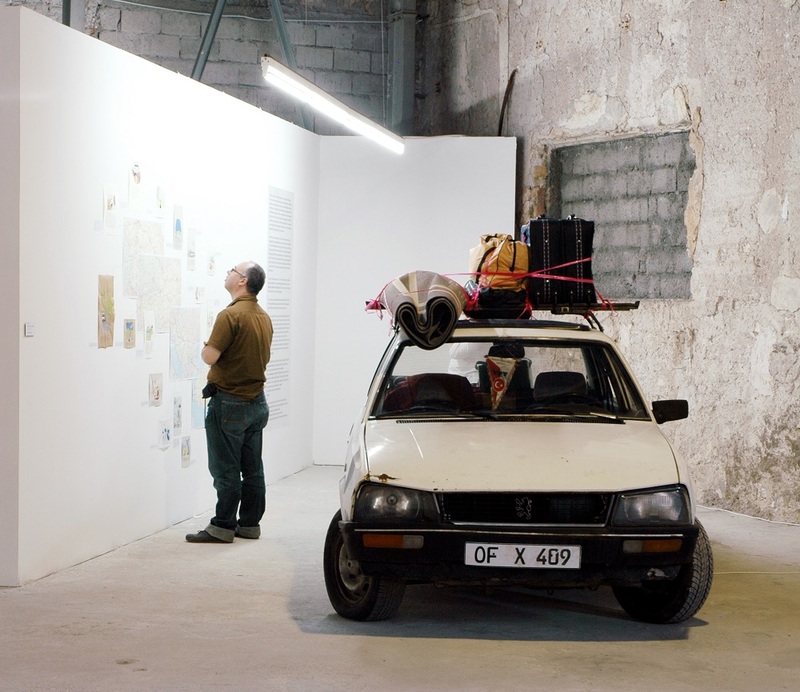 The subject of Gastarbeiter creates the crux of Behind the Wheels by Anny and Sibel Öztürk. 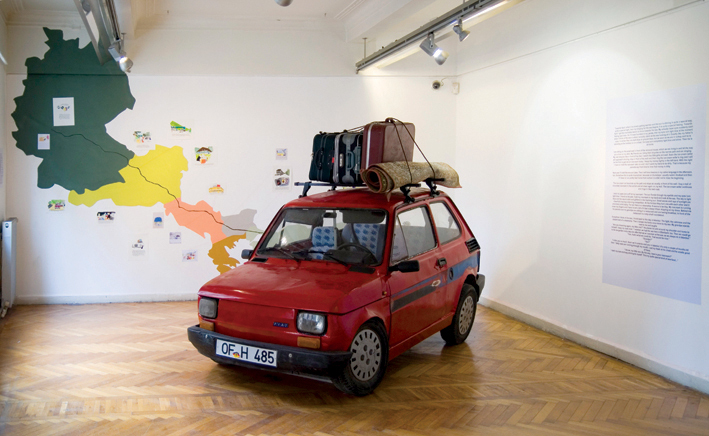 In the installation Behind the Wheel (2003), the sisters depict the annual trips back to Turkey. The older model Mercedes Benz (or like in Istanbul and in Montenegro another car model) with Offenbach license plate is in the exhibition space, with its rooftop luggage carrier packed with suitcases and a rolled up carpet. The vehicle’s interior is decorated with streamers, doilies, blankets and pillows. One can hear music alongside voices and laughter that remind us of the absent travelers. With maps illustrating the route, drawings (gouaches of moments in the journey), texts on the walls (speaking of longing for the grandfather, the south, the sea), this story tells of the communal experience among the Gastarbeiter, in Germany presenting us a (re)creation of an annual journey between these two countries. Through this work, the Öztürk sisters turn their family trips into a collectively shared experience and memory, and their experience and memory into an art installation. Our parents left for Germany in 1972. Their decision was made more from a desire for adventure, wanderlust. Both journalists, well off and with one child, they set off to see the world. They did not go to make money. They went to experience something new . My home is in more than one culture, this fact is reality for a huge amount of Europeans and by no means an exception. This has a big influence on my work and on the collaboration with my sister Sibel. Many of our works are based on memories. Most of them refer to shared familiar memories. Therefore we have reference fields whose character differentiates in a cultural context, Germany and Turkey. Both are inextricably linked with each other . Our connection to Turkey is strong… in our hearts. The language I use when thinking, dreaming, and speaking is German. My Turkish is more of a foreign language. I always want to live in Germany, but I want to be buried in Turkey with my ancestors, with my family . Through their work, we can see how migrants transform geographic and cultural boundaries, how such ‘travels’ potentially change and challenge presupposed understandings of identity. Anny Öztürk, die noch in Istanbul zur Welt kam, und ihre Schwester Sibel Öztürk, geboren in Eberbach/Neckar, gehören der zweiten Generation türkischer Migranten an und haben an der Frankfurter Städelschule studiert. Sie beschäftigen sich intensiv mit der Konstruktion von Erinnerung und mit Räumen, in denen sich Erinnerung abzeichnet. Dabei geht es nicht darum, originäre Erlebnisse und Bilder abzurufen, sondern diese retrospektiv zu erneuern und zu kontextualisieren. Die Erinnerungsform ist stets eine rückblickende, der Ausgangspunkt aber ist die Gegenwart der Künstlerinnen. Bei den Öztürks ist das Erinnern und das damit verbundene Produzieren von Bildern und Texten Bestandteil ihrer künstlerischen Verfahrensweise. Ausgangspunkt für viele ihrer Arbeiten ist die eigene Kinderzeit, Erfahrungen, die sie und ihr Aufwachsen prägten. Im Zentrum ihrer Installation Behind the Wheel beispielsweise steht ein historischer weißer Mercedes, der mit Koffern und Teppich beladen ist. Das Kennzeichen OF – X 409 verortet den Wagen im hessischen Offenbach, wo die Öztürk-Schwestern aufwuchsen. Von dort ging es alljährlich im Sommer in die Türkei, und die tagelange Autofahrt führte die Familie durch osteuropäische Länder wie Jugoslawien, Bulgarien, Österreich, Italien, Griechenland und auch mal Rumänien. Diese Reiseroute dokumentieren die Öztürks auf mehreren Landkarten und verbinden einzelne Stationen dieser Fahrt mit Erinnerungsbildern. In diesen kolorierten Zeichnungen, die auf eigenen Familienfotografien beruhen, visualisieren Öztürks kleine Szenen. Handgeschriebene Texte erläutern die Bilder, breiten aber auch ein Narrativ aus, das scheinbar auf erlebter Erinnerung basiert und einen tagebuchähnlichen Charakter evoziert. Da die Bilder jedoch stets formelhaft und reduziert wirken, die Personen mehr als Typen denn als Individuen ins Bild treten, wird von der subjektiven Erinnerung abstrahiert und es bleibt Platz für eigene Projektionen. Öztürks verarbeiten in ihren Zeichnungen Ausschnitte aus einer Kindheit, die von einer nicht-deutschen Herkunft geprägt ist, sie beschreiben einen Zustand, der ihre Sozialisation bestimmte. Nur während der Sommermonate lebten die beiden bei Großeltern und Tanten und waren mit anderen Gebräuchen und Traditionen konfrontiert. Diese Erfahrung teilen sie mit vielen anderen Migrantenkindern, die Jahr für Jahr in das Herkunftsland der Elterngeneration fuhren und dort nur einen Ausschnitt einer sogenannten Heimat erlebten. „Anny and Sibel Öztürk`s works are founded on the experience of their parents immigration to Germany in the `70s. Anny was born in Turkey, Sibel in Germany, but they were both brought up in Frankfurt. They know their own Turkish past/identity (only) from pictures, stories and some visits to Turkish relatives. In their „Frankfurter Zimmer („Re-Collection“) they reconstructed a (their) Turkish room – based on a mixture on narrative, memory and imagination. The room contains various pieces of furniture, (their) toys, old photographs and documents, and a replica of their aunts beloved divan, all in `70s style. Super-8 films of the two girls are shown on a television. A series of color drawings on the wall shows the little black haired Anny in the first year of her life:“I could already talk when I was only six month old. The thing I loved doing most was watching people and listening to them“, it says under a picture from the „Familienalbum“ series. The Frankfurter Zimmer is more than a reconstruction of a Turkish identity that ultimately – like the room itself – has to remain incomplete. The so called „Dresdner Zimmer“ was created as a counterpart to the Frankfurter Zimmer. The Öztürks travelled to the former GDR for the first time in the year 2000, where they found places that seemed to fit precisely with their image of East Germany. They also believed that the GDR was gray, bleak, dull, sunless ect. The Czech, Polish and generally Eastern European movies that they saw as children, like „Lucy der schrecken der Strasse“, „Die Zauberbraut“, „Das eiserne Herz“, ect, ultimately shaped their image of the GDR, which seemed to be generally much less colourful than the Federal Republik. In their „Dresdner Zimmer“ the Öztürk`s realized an image that they had had in their heads for years. They used cardboard, fabric and self-adhesive imitation woodgrain plastic veneer to built an armchair, a sofa, a table and a sideboard. Stills taken from well-known Defa movies hung on the walls of the room. The Frankfurter Zimmer and the „Dresdner Zimmer“ relate to each other and the way the rooms were constructed is made absolutely clear: the reconstructions are obviously reconstructions, the furnishings are fragmentary, just enough to show the intended function of the individual rooms. The Dresden Room was realized as a counterpart of the Frankfurt Room. In 2000, the Öztürks visited the former East Germany for the first time. They came across places that seemed perfectly compatible with the image they had in their mind of the East. Just as the two artists conceived of Turkey as a ‚black-and-white‘ country because of the black-and-white photographs hanging in their grandparents‘ homes, they also believed that East Germany was a grey, bleak and faded country in which the sun never shone. Their perception of (life in) the East was ultimately the product of images they had seen as children in Czech or Polish movies. The Dresden Room contains furniture – an armchair, a sofa, a table and sideboard – made of cardboard, fabric and self-adhesive imitation-wood-grain plastic veneer. Stills taken from famous DEFA movies (the Deutsche Film-Aktiengesellschaft was the East German state’s official film studio) hang on the walls. In both the Frankfurt Room and the Dresden Room, the Öztürks contrasts their memories of a Turkish childhood with their views of childhood in East Germany, and in both cases they fall back on the clichéd images that underlie their view of the two cultures. Auf einer Wand findet sich ein aus einzelnen Leuchtbuchstaben gebildeter Schriftzug. Daneben hängt links eine Zeichnung mit Textzusatz und rechts eine Reihe von Photographien. Vor der Wand, frei im Raum, befindet sich ein thekenartiges Möbel, auf dem Informationsmaterial zum Projekt „Jolie Charité“ ausliegt. Jeder einzelne Buchstabe steht zusammen mit einer Zeichnung zum Verkauf. Mit dem Erwerb des Kunstwerkes geht die Übernahme einer einjährigen Patenschaft für ein Kind bei SOS-KInderdorf oder eine Projektpatenschaft bei Unicef einher. Photographien der im privaten Bereich der SammlerInnen installierten Buchstaben ergänzen die Installation. Jolie Charité besteht aus zwei Installationen, die unabhängig voneinander gezeigt werden. Einmal wird mit demSchriftzug aus farbigen Leuchtbuchstaben auf weißer Wand der Name der legendären amerikanischen Tänzerin, Sängerin und Schauspielerin Josephine Baker ausgeschrieben, und einmal der Name der amerikanischen Filmschauspielerin Angelina Jolie. am Boden bündeln die Kabel und ermöglichen, dass der Namenszug an der Wand leuchtend erstrahlen kann. die über das Projekt „Jolie Charité“ und sein Anliegen informieren, sowie Material der Organisationen UNICEF und SOS-Kinderdorf. Neben Schriftzug und Theke hängt je eine Zeichnung, die motivisch und mit Text in das Projekt einführt. Daneben sind einige Photos an der Wand angebracht. den Textzusatz: Ich selbst kannte sie lange Zeit nur als „die Tänzerin mit dem gelben Bananenröckchen“. Josephine Baker adoptierte 12 Kinder verschiedener Hautfarben und Ethnien, damit protestierte sie auf ihre Art gegen den Rassismus. Oh, jolie Charitè! Josephine Baker starb 1975 nach einem sensationellen Come-Back. Im Jahr 1975 war Anny Öztürk fünf Jahre alt und Sibel Öztürk wurde geboren. Für die Künstlerinnen ergibt sich folgerichtig die ihrer Zeitgenossenschaft entsprechende Rezeption der Ereignisse, die eine Nachfolge vor dem Vorbild sichtbar werden lässt. Das heißt: Die im Hier und Jetzt agierende Angelina Jolie lenkt den Blick zurück auf ihr historisches Vorbild. Das aquarellierte Blatt zeigt das amerikanische Schauspielerehepaar Brad Pitt und Angelina Jolie mit ihrer aus Äthopien stammenden Adoptivtocher Zahara und ihrem aus Kambodscha stammenden Adoptivsohn Maddox. inbegriffene einjährige SOS-Kinderdorf für ein Kind oder eine Unicef Projektpatenschaft übernommen. Die geneigten SammlerInnen sind aufgefordert, die erworbenen Buchstaben zusammen mit der Zeichnung im eigenen Heim zu installieren und den Leuchtbuchstaben als Lampe zu benutzen. Dabei wäre es wünschenswert, würden die Leuchtkörper im Bereich des alltäglichen Umfelds platziert und aufgenommen. Die solchermassen im privaten Umfeld integrierten Buchstabenlampen werden, bevorzugtermassen mit den ins Bild gerückten SammlerInnen, von den Künstlerinnen dokumentiert. Diese Photos werden zu einem Bestandteil der Installation im Museum. Die legendäre amerikanische Künstlerin Josephine Baker war eine der bedeutendsten Entertainerinnen ihrer Zeit. der Légion d`Honneur. Seit 1950 startete sie ihr eigenes, privates „Experiment der Brüderlichkeit“, indem sie eine Familie gründete und seit 1950 12 Kinder unterschiedlicher nationaler, ethnischer und religiöser Herkunft adoptierte. Diese Familie bezeichnete sie als „The Rainbow tribe“ und verstand ihr Familienleben als ein wegweisendes politisches, kulturelles und soziales Vorbild. „Regenbogenfamilie“. Angelina Jolie und Bratt Pitt stellen ihre große internationale Bekanntheit und Popularität in den Dienst internationaler politischer und sozialer Arbeit. Angelina Jolie ist seit 2001 „Botschafterin der guten Hoffnung“ des United Nations High Commissioner for Refugees; eine Aufgabe, die sie mit großem Engagement wahrnimmt und für die sie 2005 mit dem „Global Humanitarian Action Award“ ausgezeichnet wurde. Jolie ist außerdem Unicef-Botschafterin. Gemeinsam mit ihrem Mann unterstützt sie zahlreiche internationale Hilfsprojekte und globale Interessengruppen. Beide Frauen eint der Wille, außerhalb des öffentlichen Engagements für ihre politischen und sozialen Überzeugungen auch das Familienleben als eine Frage des politischen und sozialen Engagements dann dochbedingt öffentlich und multikulturell mit klarer politischer Signalwirkung zu gestalten. Die Installation nimmt das vorbildliche Beispiel sozialen Handelns der beiden Frauen Josephine Baker und Angelina Jolie symbolisch auf und verpflichtet spielerisch und mit Humor die Sammler/innen zu einer Teilnahme. Im Zusammenspiel mit der über das Kunstwerk im Projekt vermittelten Patenschaft geht es hier um mehr als um den Erwerb einer weiteren künstlerischen Arbeit. Ein Erwerb bedeutet eine Teilnahme an dem Projekt „Jolie Charité“. Es wäre wünschenswert, würden die Sammler/innen vor diesem Hintergrund ein Leben mit den Leuchtbuchstaben gleichsam als „Adoption“ des Objektes in die eigenen Lebenszusammenhänge begreifen. So legt das Projekt „Jolie Charité“ eine Nachahmung des leuchtenden Beispiels von Josephine Baker und Angelina Jolie nahe, auch wenn die Sammler/innen im Gegensatz zu diesen beiden Frauen in ihrem Zuhause nicht ein Kind, sondern vielmehr eine Lampe aufnehmen. Diesen Lampen jedoch ist ein in jeder Hinsicht erhellendes Wirken zu wünschen!